The mission of the Architecture Archive is to record the history of the School of Architecture’s pedagogy through the documentation of student work, to provide resources to the students in order to augment and enhance their architectural education, and to produce informative exhibitions and publications on the subject of architecture and related disciplines. In 1970 John Hejduk and Roger Canon, AR’70, established a methodology to document student work for the publication Education of An Architect: A Point of View, which coincided with an exhibition of the same name held at the Museum of Modern Art in 1971. 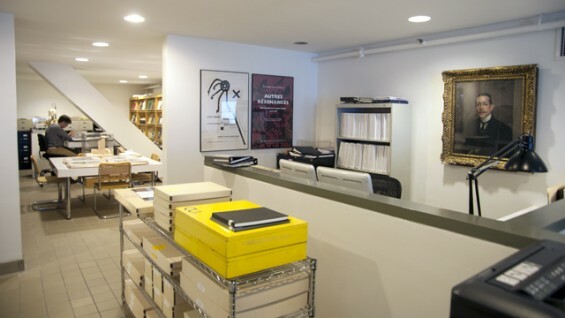 Supported by a recommendation of the 1980 National Architectural Accrediting Board (NAAB) Visiting Team, the Archive was established in 1983, and officially became a department of the School of Architecture in 1991, with Kim Shkapich, A'80, as its first Director. Steven Hillyer, AR’90, is the current Director. Each summer, the Archive documents a faculty-designated selection of models and drawings from the annual End of Year Exhibition, which is comprised of student work produced in all five undergraduate design studios, as well as the graduate research design studios. The photographic recording of these materials is subsequently used for publications, the presentation of work to the National Architectural Accrediting Board (NAAB), and to augment the student work collection, which is the largest of the Archive’s holdings. The Archive is responsible for the coordination, design, curatorship and installation of all major exhibitions presented by the School of Architecture in the Arthur A. Houghton Jr. Gallery. These installations are thematically tied to the pedagogical objectives of the School of Architecture and meant to expose students to the works of architects, painters, photographers and other individuals who work in related disciplines. In keeping with The Cooper Union’s longstanding tradition of engaging the greater community of New York City, all Houghton Gallery exhibitions are free and open to the public. Since the completion of the completion of the gallery at 41 Cooper Square in 2009, the Houghton Gallery has been under the primary stewardship of the School of Architecture. The Archive also presents exhibitions during the school year that are drawn from the resources of its various collections, as well as other works that might be of interest to the students. These materials are exhibited in the third floor hallway, one of the main thoroughfares of the School of Architecture. At the end of every spring semester, the architecture studios are emptied and transformed into exhibition space. At that time, the Archive prepares these spaces and supports the needs of the students and their respective design studio faculty as they install a selection of work completed during the school year. The Archive is responsible for assembling materials for review by the NAAB, which usually takes place every six years. This includes the presentation of the documentation of design projects and samples of coursework for all required and elective classes that lead to a Bachelor of Architecture degree. To compliment this presentation, the Archive coordinates and installs exhibitions of student and faculty work to make a clear, didactic presentation of the school’s pedagogy. Work study and part-time student help supplement the daily activities within the office, which include the handling of archival materials, documentation of student work, transcription of text documents and scanning materials for exhibitions and publications. Students also assist in the construction and installation of exhibitions in both the Houghton Gallery and third floor hallway.